The BGI 210i is operated by four keys on the front panel. 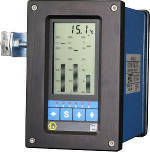 Due the intrinsically safe design and the IP65 front, the three channel bargraph indicator BGI 210 i is the best choice for automation of super-visory tasks at process level. By directly connecting the sensors to the BGI 210 i, the necessary signal separation to safe area may be dropped. That means minimizing the installation and investment costs.